This book reads as a journal filled with gorgeus illustrations of dragons, places where different breeds have been spotted in and so on. While visually impressive, I was terribly, terribly bored with it and had to drop reading it. Maybe I would've enjoyed it more in physical format, not as en e-galley. 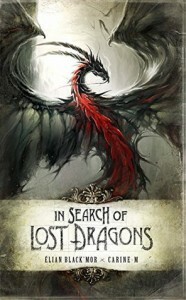 Recommended to those who are fascinated with dragons and don't necessarilly need a story and a plot to enjoy something like this. I just couldn't find its purpose. The 3 stars are for the design and everything, which really were flawless.